Dirty water from a flood crisis in northern Australia has spread to parts of the Great Barrier Reef, placing it under stress, scientists say. The floods are the result of weeks of devastating rain in Queensland. Aerial pictures show that run-off from one river has blanketed some reef areas more than 60km (37 miles) from shore. Scientists fear the sediment-laden waters may be blocking out light and effectively "smothering" coral. Tests are yet to be undertaken. The Great Barrier Reef, located in the Coral Sea off the coast of Queensland, is a diverse World Heritage site that spans an area of 344,400 sq km (133,000 sq mi). 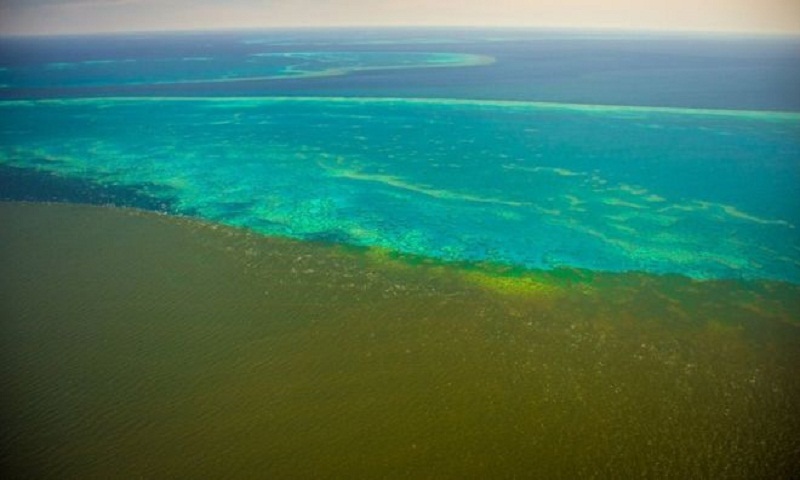 In recent weeks, run-off from several rivers has coalesced to affect an approximately 600km stretch of the reef's outer edges, scientists say. The water has not dispersed due to its size and a recent lack of wind. "Generally a bit of wind and wave action can break the plumes up quite quickly, but we have literally had no wind so they're just sitting there hanging," said Dr Frederieke Kroon from the Australian Institute of Marine Science. She told the BBC that the nutrient-rich water had also sparked algae growth in some areas, turning waters "a thick blanket of green". "The biggest concern at the moment is this reduced light - if it persists for much longer, in some cases we can actually see a smothering of the system," said Jane Waterhouse, a scientist from James Cook University's TropWATER research unit. However, she said strong winds - if they eventuated - could mitigate the impact. The reef is already facing threats to its survival such as coral bleaching caused by warmer sea temperatures. Mass bleaching events occurred in 2016 and 2017. It has also been damaged by cyclones and crown-of thorns starfish. Large parts of Queensland have been gripped by floods in recent weeks, after some regions experienced the equivalent of a year's rainfall in 10 days. Last week, two people were found dead in floodwaters that inundated low-lying areas in the city of Townsville. The UN calls the Great Barrier Reef the "most biodiverse" of all the World Heritage sites, and of "enormous scientific and intrinsic importance".